New recordings present musical theater of the past (such as “Paint Your Wagon”), as well as new works by talented songwriters on the current scene. The Public Theater has been presenting innovative musicals since the time of “Hair.” While some of the shows have gone on to tremendous success on Broadway (for example, “Hamilton”), others just as worthy have been considered as not commercial enough for a move uptown. 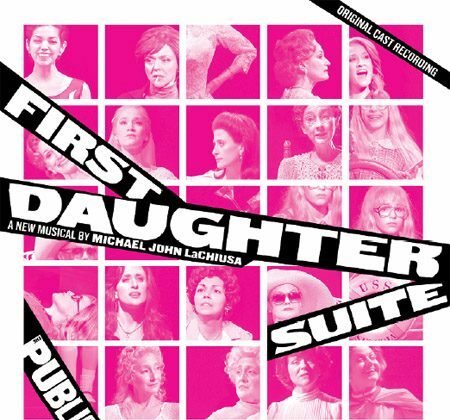 I was lucky to see one of the last performances of Michael John LaChiusa’s “First Daughter Suite” at the Public. The multi-talented LaChiusa wrote the book, text, and the music. Now, a 2-CD set has been released on Ghostlight Records, and it confirms the originality of the text and the melodic sweep of the music. The work is in four parts. Part One, “Happy Pat,” takes place on the wedding day of first daughter Tricia Nixon. The weather is threatening, jeopardizing plans to hold the event outdoors. Martha Mitchell, the attorney general’s wife, is a loose cannon, showing up in an inappropriate outfit. President Nixon doesn’t appear, but the women discuss the fraught political situation (such as the release of the Pentagon Papers). There are tender moments as Pat Nixon reflects on her courtship and gives Tricia tips about marriage. The president’s mother, Hannah Nixon, appears as a ghost and expresses less hopeful views. In the end, Tricia takes charge, deciding to hold the wedding outside. Part Two, “Amy Carter’s Fabulous Dream Adventure,” is a comic fantasy. The president’s 12-year-old daughter Amy dreams, while Betty Ford, wife of the former president, drinks. Susan Ford, daughter of Gerald and Betty, convinces Amy to free the hostages in Iran. It turns out that this is a plot by Susan to retake the White House. At the end, they all make amends and decide to take a vacation in Puerto Rico. Part Three, “Patti by the Pool,” examines the strained relations between Patti Reagan and her mother, Nancy. The president and Nancy are mad about Patti’s novel, a thinly disguised exposé of the family. Anita Castelo, Nancy’s Peruvian maid, is involved in smuggling guns to Paraguayan rebels and Patti needles her mother about the Iran-Contra scandal. The maid drugs Patti’s drink, and after she passes out, Nancy and Anita manage to relax. Part Four, “In the Deep Bosom of the Ocean Buried,” begins in October 2003 with Barbara Bush reflecting on the death of her 3-year-old daughter Robin 50 years earlier from leukemia. Robin’s ghost appears and so does Laura Bush, the latter to remind Barbara of her upcoming schedule of events in George W.’s second presidential campaign. There is tension between the two because Barbara has a low opinion of her son’s competence in office. Barbara is still haunted by the loss of her daughter, but in the end Laura convinces her to help her son win re-election. The cast (some of whom play two roles) is excellent: Alison Fraser (Nancy Reagan, Betty Ford), Rachel Bay Jones (Laura Bush, Rosalynn Carter), Caissie Levy (Patti Davis, Julie Nixon), Theresa McCarthy (Robin Bush, Hannah Nixon), Betsy Morgan (Tricia Nixon, Susan Ford), Isabel Santiago (Anita Castelo), Carly Tamer (Amy Carter), Mary Testa (Barbara Bush), and Barbara Walsh (Pat Nixon). “Bright Star” is a bluegrass musical with music, lyrics, and story by Steve Martin and Edie Brickell, with the book by Martin. The plot involves a poor girl falling in love with a rich boy, who impregnates her. There is another story taking place many years later when the girl is a literary editor and discovers a talented young Southern writer. At the end, the two plots converge into a happy ending. Though there are witty lines here and there, the book is surprisingly stodgy for the formerly “wild and crazy” guy. Fortunately, the show is filled with delightful songs, and Carmen Cusack, making her Broadway debut in the starring role of Alice Murphy, is wonderful. I have mixed feelings about the show, but the original cast album, produced by Peter Asher, on Ghostlight Records, is a winner. Another outstanding musical at the Public Theater was “Here Lies Love,” which had music and lyrics by David Byrne and Fatboy Slim. One of the stars of that production, Jose Llana, has a solo album, “Altitude.” He performs two songs from that show, one with his co-star Ruthie Ann Miles. They appeared together in the recent revival of “The King of I” (for which she won a Tony award; he played the King of Siam). Llana sings a medley of “We Kiss in a Shadow” and “I Have Dreamed” and “A Puzzlement” from “The King and I,” and also several from “Saturn Returns” by Richard Rodgers’s grandson Adam Guettel. Also featured are songs from “On the Town” and “Company.” Llana’s singing is unfailingly tasteful. The two reminisce about their careers and the legendary figures they worked with, and perform songs from these and other shows. Sadly, Mallory died of cancer two years after this concert, but this treasurable recording is a memorial to her art and that of Peterson. “Paint Your Wagon” is a 1951 musical about the California Gold Rush by Lerner and Lowe, who were also responsible for the songs in “Brigadoon” and “My Fair Lady.” Masterworks Broadway has just released the New York City Encores! cast recording of the show and it is revelatory. Importantly, it also contains a great deal of music that was omitted from the original LP, including the dance music and the song “What Do the Other Folks Do?” The Encores! stars—Keith Carradine, Justin Guarini, and Alexandra Socha—are a match for the original 1951 Broadway cast.